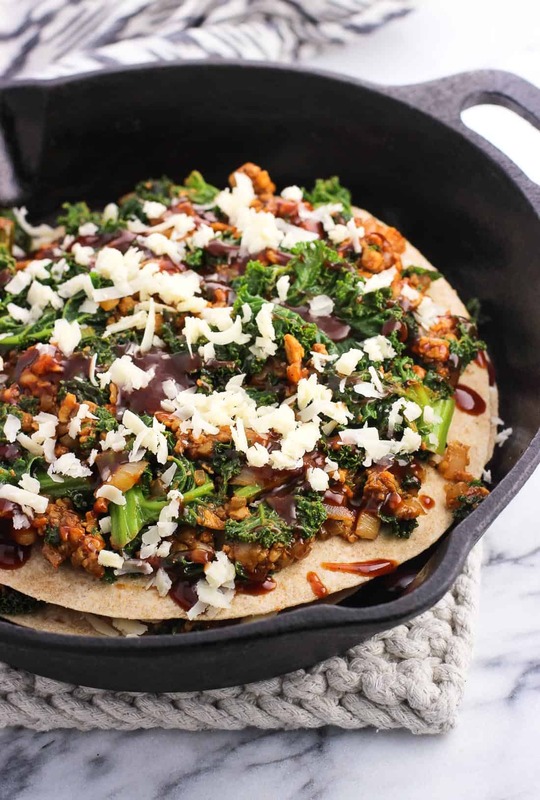 BBQ Tempeh Kale Tortilla Pie is a hearty and delicious vegetarian meal made all in one skillet! This quick recipe makes a great weeknight dinner. It’s perfect for Meatless Monday – or any day. This recipe is a few years old by now, but I’m reminded of how clutch it is every time I make it. 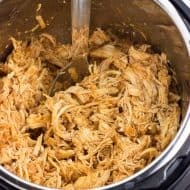 Tortilla pies are a fairly frequent occurrence in my house, but I tend to think of chicken or beef as my go-to. 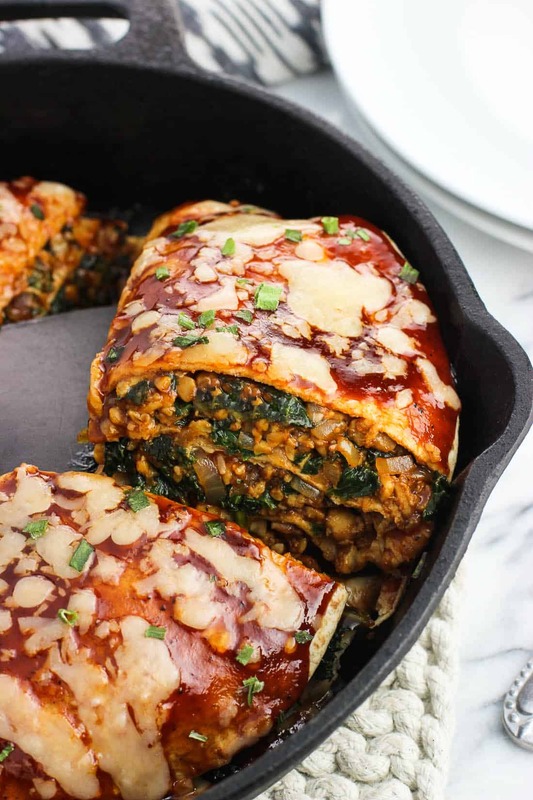 However this BBQ tempeh kale tortilla pie is vegetarian and HEARTY. Hearty in all caps because it’s healthy and so filling. I guarantee you can serve this to typical meat-eaters and they wouldn’t even bat an eye. 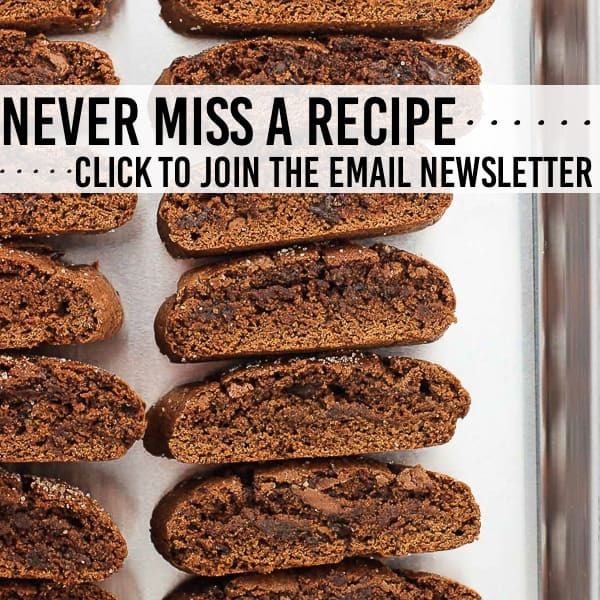 Well, they might if you tell them it’s packed with tempeh (temp-who?) and kale beforehand, but try and hold onto that tidbit of information until they’ve cleaned their plate. 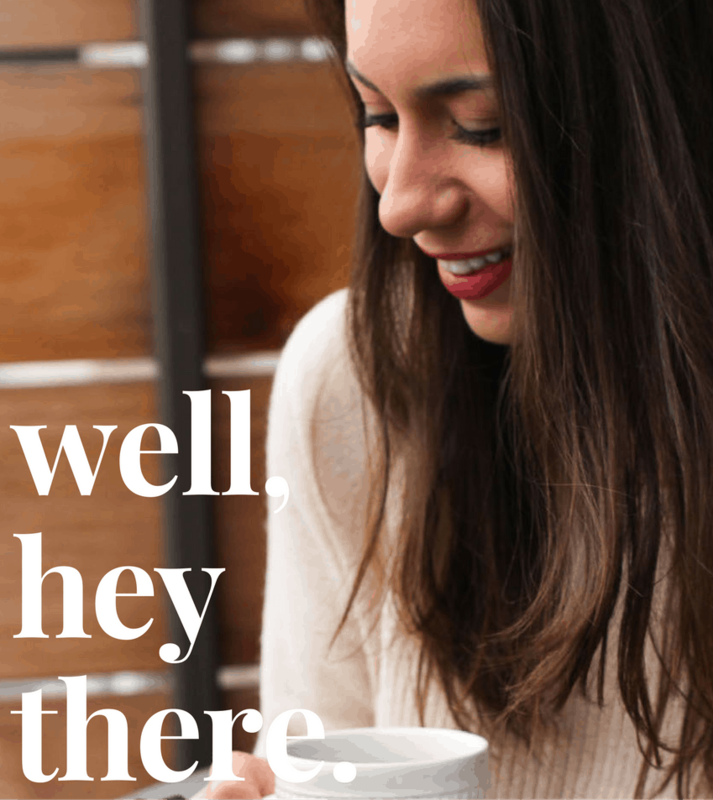 Are you a tempeh fan? Tofu seems to be the more popular soy-based protein, but as I’ve mentioned before, someone in my house isn’t a huge fan of its texture. Tempeh however? Totally different. It’s not spongy and when grated (my favorite way to prepare it!) it blends easily into whatever it is you’re making. It’s definitely a great ground meat substitute in recipes like this. I’ve posted three tortilla pies before (buffalo chicken tortilla pie, cheesy salsa verde tortilla pie, and five-ingredient BBQ beef tortilla pie), but I can’t get enough of them. 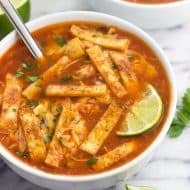 For one, they’re super simple – just layer filling (beef, chicken, turkey, tempeh…) between tortillas, top with sauce and cheese, and bake until cheese is bubbly. So many possibilities, right? 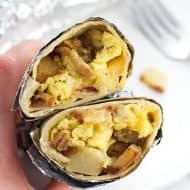 It’s a great meal idea to have in your back pocket for those days when you open the fridge and nothing jumps out at you. 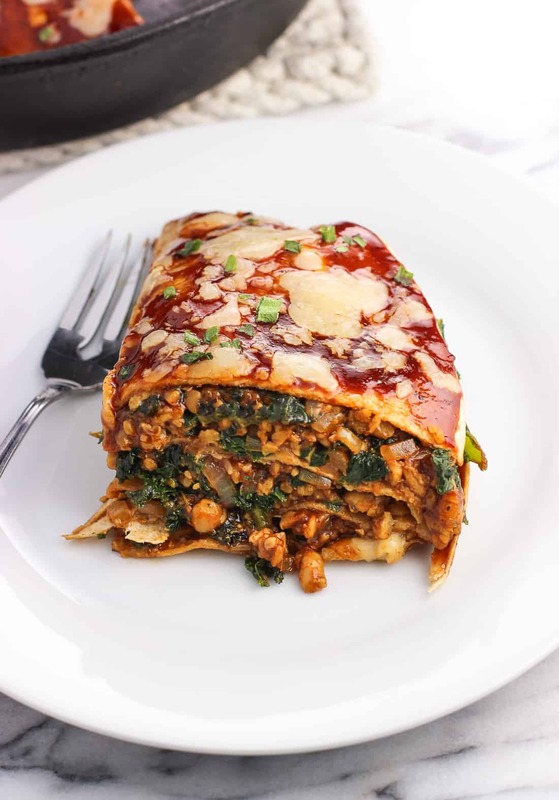 This BBQ tempeh kale tortilla pie features a mixture of sauteed kale, grated tempeh, smoky spices, onion, garlic, and cheese. This filling holds together well and adds a great layer between the tortillas. To boost the nutrition of this BBQ tempeh kale tortilla pie in particular, I used whole wheat tortillas. Can you use any variety of tortilla you have on hand? Definitely! Would you rather use spinach than the kale? Go for it! Are you looking to use up some extra potato wedges you’ve got laying around? Chop them up and throw them in! I’ll be cheering you on – this dish is SO versatile. 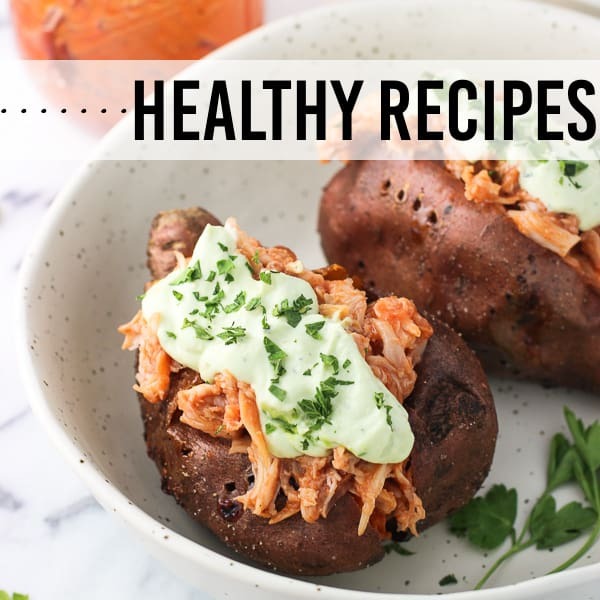 Whatever you decide to call it, it’s a healthy, hearty, and relatively quick main dish that you’ll want to add to your rotation! When adding the mixture on top of the tortillas, try and spread it evenly from the center to the edges. You may wish to spread it a little bit taller around the edges to prevent the tortilla pie from having a taller center and sloped ends. 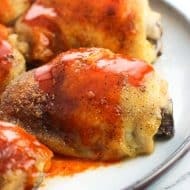 Use your favorite BBQ sauce! I’ve used one-half teaspoon of chipotle chili powder instead of the regular chili powder called for in the recipe card below and really enjoyed it. You may notice I said that this is a one-skillet recipe and I have it pictured step-by-step in two different pans. I absent-mindedly grabbed a second pan when making it for these photos (more dishes to wash – boo! ), but it can easily be done in just one, which is as it’s written in the recipe below. Heat 1 tbsp of olive oil in a large oven-safe skillet over medium/high heat. Add kale and water, and stir. Cover and cook until kale leaves are wilted. Once wilted, remove the kale from skillet to a large bowl. Preheat oven to 350°F. In the now-empty pan, add remaining 1 tbsp of olive oil and chopped onion. Cook for a 2-3 minutes over medium heat, or until onions become slightly golden. Then add minced garlic and cook for an additional 1-2 minutes. 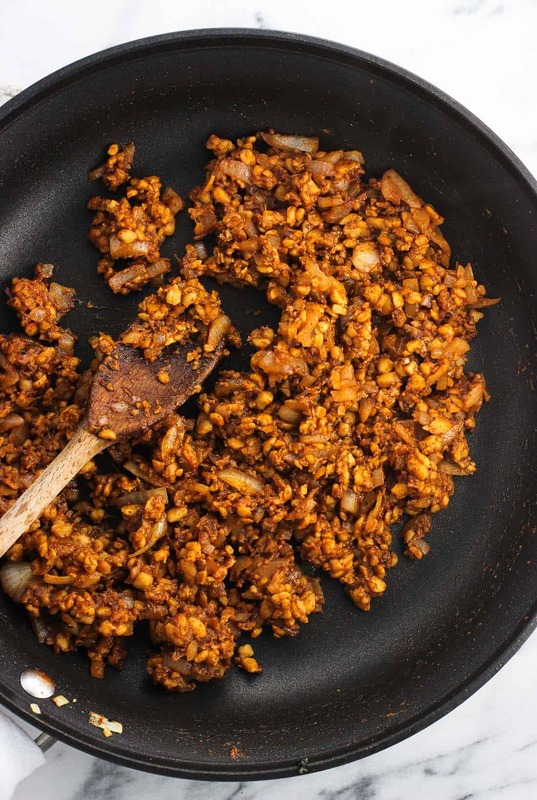 Add grated tempeh, 1/2 cup of the BBQ sauce, liquid smoke, coriander, and chili powder to the pan with the onion and garlic. Stir to combine ingredients, and let tempeh mixture cook for 5 minutes. 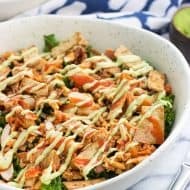 Turn out tempeh mixture into the bowl with the kale and wipe skillet clean (it doesn't have to be perfect). Stir together the kale and tempeh mixture evenly. Add one tortilla to the bottom of now-empty skillet. Spread one-third of the tempeh/kale mixture evenly over the tortilla. Drizzle 1-2 tbsp of BBQ sauce over top of tempeh, and sprinkle with 1/4 cup cheese. Continue the process: Second tortilla, next one-third of tempeh/kale mixture, 1-2 tbsp of BBQ sauce, 1/4 cup cheese. Third tortilla, remaining one-third of tempeh mixture, 1-2 tbsp of BBQ sauce, 1/4 cup cheese. End with adding the fourth tortilla, another 1-2 tbsp of BBQ sauce, and 1/4 cup cheese. 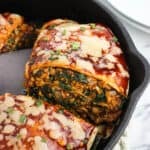 Place BBQ tempeh kale tortilla pie in preheated oven for 10-15 minutes, or until the cheese is melted and gooey and the tortilla pie is heated throughout. Oh, Alyssa, I’m so glad you explained what tempeh was for me because I was feeling a bit dumb until that point not remembering what it was! I absolutely love the idea of it appearing like beef mince and taking on all those beautiful flavours you’ve added in. Oh, and I have to ‘trick’ my hubby into eating things sometimes by adding meat, too. Even just a few bits of spicy chorizo or something usually does the trick … hehe! Haha Helen! That spicy chorizo trick sounds super effective actually – I’ll have to keep it in mind! I love grating/crumbling tempeh and adding a bunch of spices as it’s sauteeing. It really becomes a food chameleon and would blend into a lot of dishes. I’ve never tried tempeh, but this looks delish! Yum!! This looks amazing! Love the idea of a tortilla pie- so delicious! Thanks Jess! Tortilla pies are a staple around here – so easy to make and you can just about throw anything in! I haven’t tried tempeh- but I’d like to try it now! Love tortilla pie ANYTHING…and this looks really delicious. So creative! What a creative dish, Alyssa! I’ve never actually heard of tempeh, but now I’m intrigued. I love the kale and bbq sauce in here too, sounds like the perfect meal! Thank you Kelly! You’re right – the tempeh goes so well with BBQ sauce. The kale definitely sneaks in under the radar here, so I don’t think you’d have much trouble getting kale-finicky taste buds to enjoy it! wow I love Tempeh, it’s traditional food from Indonesia. I’m originally from Indonesia, I never eat tempeh this way, great recipe, I can’t wait to try it. Can you please invite me over for dinner next time you make this?! I can hardly take my eyes off of the plate with that amazing looking slice of savory pie ;). I CANNOT wait to make this. I have a feeling my meat-loving hubby would be all over this as well! Haha sure thing! Thanks Kathi! This would be a great dish to make if both vegetarian and meat-loving palates were at the table (sans bacon, of course)! I imagine this terrific Tortilla Pie would be great warmed the next day after the flavors have had a chance to mingle. Well, if here’s any left over! 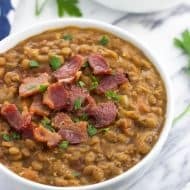 A great recipe with a vegan twist! I’ve never tried tempeh before, I can’t lie it kind of scares me a little. But after looking at this dish I’m kind of wanting to try it now! How awesome that your husband loved it too! Haha I remember being pretty leery of tempeh the first time I tried it. 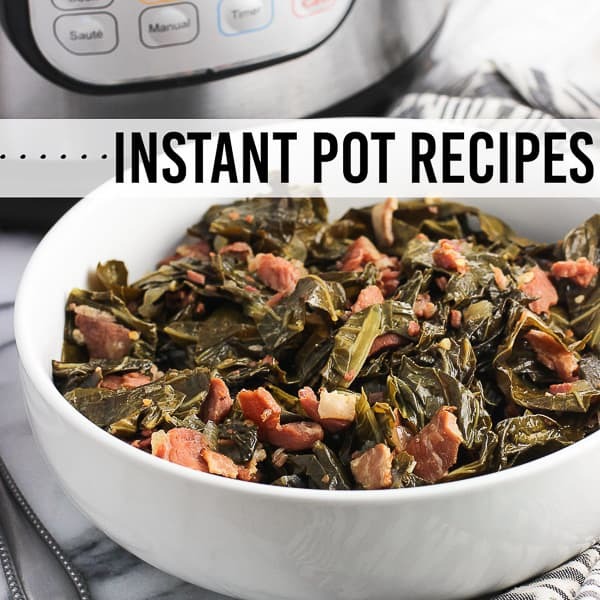 There are so many flavors going on in this dish though that you’ll barely even taste it – it blends in perfectly! BBQ kale pie? Yes please! It’s like 2 of my favourite things together. Yum! Thanks Dannii! I love BBQ and kale, too! Hallo Marcie, Tempeh is soy product -made from soybeans, originally from Indonesia (I’m Indonesian :-)), it’s very popular there. You should try it 🙂 delicious.